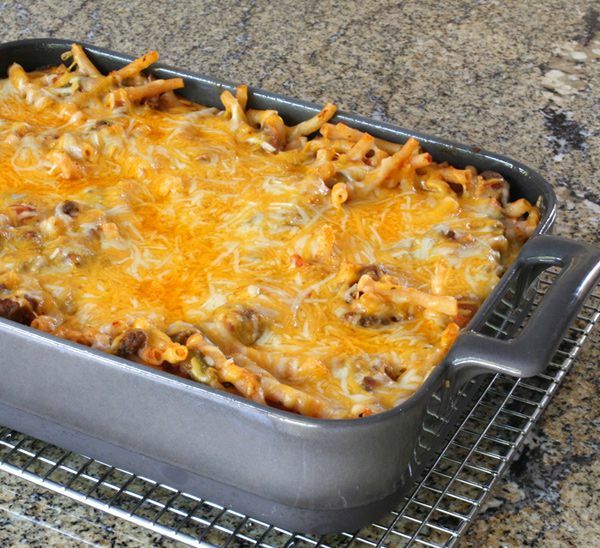 This is an easy macaroni and ground beef casserole recipe, and it makes a great-tasting dinner for any night of the week. Add a tossed salad and warm rolls or crusty bread for a perfect meal. We used our favorite arrabbiata sauce in this recipe, but any good marinara or tomato sauce will work. Cook macaroni in boiling salted water following package directions. Drain the macaroni in a colander and rinse with hot water. Spray a 2 1/2- to 3-quart baking dish with nonstick cooking spray or butter lightly. In a large skillet, heat the olive oil over medium heat. Add the onion, bell pepper, and celery; cook, stirring, for about 3 to 4 minutes, until tender. Add the ground beef and cook, stirring and breaking up, until no longer pink. Add the garlic and cook for 1 minute longer. Add the spaghetti sauce and tomato paste. Bring to a simmer. Simmer for 5 minutes. Add the cooked and drained macaroni and stir to blend. Transfer to the baking dish. Top with the cheese and bake for 20 to 25 minutes, until cheese is melted and the mixture is bubbly.